All manner of fantastical creature populated the Earth for 450 million years between the mid-Paleozoic and late-Cenozoic eras. Unfortunately, placing any of them in Toronto is simply impossible. Long before human beings arrived to perform the function, rocks acted as Earth’s record-keepers. Today, they hold faithful and extensive accounts of the planet as it once was. To learn what kinds of plant and animal life came before us, whether and where there were bodies of water, and even what the atmosphere was like once upon a time, scientists look for evidence in sedimentary rocks. But were you to begin to dig a hole in a Toronto backyard, you would soon see the limitations of this method of historical preservation. At first, you would contend with gravel, clay, and sand deposited by ice-age glaciers and lakes, most of it less than 100,000 years old. The next thing you would find would be 450-million-year-old Ordovician bedrock. It would be as though the hundreds of millions of years in between had never even happened. This is not out of the ordinary. In fact, nowhere in the world can boast a complete and uninterrupted rock record. Even in Arizona’s Grand Canyon, where a cross-section of layered rock more than a kilometre deep has been exposed by the unrelenting Colorado River, there are major gaps in the timeline. Together these fragments form a continuous time scale, assembled piece by piece over many years and many continents. Because of this, we are at least able to say what happened in other parts of the world after the abrupt discontinuation of our rock record. Near the end of the Ordovician period, the planet saw the rapid onset of an ice age. Glaciers formed over the South Pole, and the water that had pooled on the continents disappeared as ocean levels dropped by as much as 100 metres. There was still very little life on land, but a loss of habitat and inhospitable climates drove many marine species extinct, the Isotelus trilobite among them. Temperatures rose again in the Silurian period and, some 30 million years later, the planet entered the age of fishes: the Devonian period. Dunkleosteus—the largest of the creatures that gave the Devonian its nickname—was 10 metres in length, and opened its powerful predatory jaws extra wide by lifting up the roof of its skull. Late in the Devonian, yet another extinction event (probably also climate-related, but less understood than the one at the end of the Ordovician) killed off all the world’s remaining trilobites save for one: the nondescript adaptable Proetid, which would somehow manage to survive for another 120 million years. The biosphere rebounded once more. Amphibians began to thrive in the Carboniferous period, and early reptiles prowled through thick forests beneath flying insects like Meganeura—dragonflies with wingspans as wide as those of present-day seagulls. 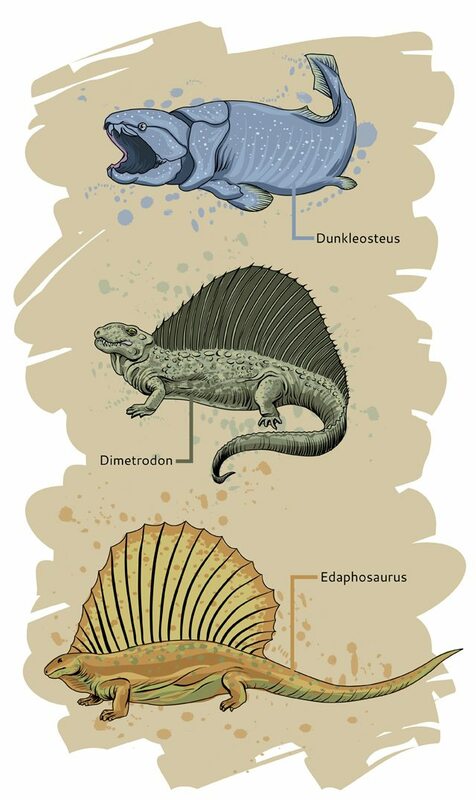 By the end of the ensuing Permian period, which had seen large sail-backed reptiles like Dimetrodon and Edaphosaurus, the mother of all historical extinctions killed off 90 per cent of the animal species on Earth, and marked the end of the Paleozoic era. The 185 million years that followed, the Mesozoic era, is well-known as the age of dinosaurs. And while it is entirely possible that the famous reptiles once made their home in what is now Toronto, we’ll never be able to say so with certainty. In fact, the entire Mesozoic record in Ontario is limited to some poorly exposed sediments near Hudson Bay, which have yet to yield so much as a single dinosaur bone. Unclear, also, is exactly why our record is so spotty. The formation of sedimentary rock—when the surface of the Earth is gradually weathered away into particles, deposited underwater, and cemented together once more—only occurs under certain geographical circumstances. There is little in Toronto happening now, for instance, to preserve contemporary skeletons for the distant future. Some of our record might also have eroded over time. The existence of Silurian rock as nearby as the Niagara escarpment suggests that there might once have been rocks of a similar vintage here. Regardless, some 135,000 years ago on the geologic time scale, our rock record suddenly reappears. By that point, the dinosaurs were long extinct and the Earth had entered the Cenezoic era’s Pleistocene epoch. Toronto was buried beneath a glacier and, before long, would be home to a suite of truly giant mammals.